Image Expo 2015 was more than the place where Paul Jenkins was announced as the new ongoing writer of Spawn. In keeping with tradition, over twenty new series (and/or mini-series) were unveiled for the coming year, by the publisher leading the creator-owned comics surge in popularity: Image Comics. The top seven of which, look like this. A.D.: AFTER DEATH Scott Snyder writes the tale of a world where death is curable, exploring what happens next through a man who has lived multiple lives, and the artistic skills of Jeff Lemire. ISLAND Spearheaded by writer Brandon Graham, this anthology dubbed 'The Comics Magazine for Comics' will feature work from a variety of new and established creators, making it like buying 2-3 comics stapled together, with articles. SONS OF THE DEVIL The estranged son of a cult leader gets pulled back into his fathers plans, after 25 years of life in foster care, and soon finds his father has plans for his other eight siblings as well. From Detective Comics Brian Buccellato and illustrator Toni Infante. 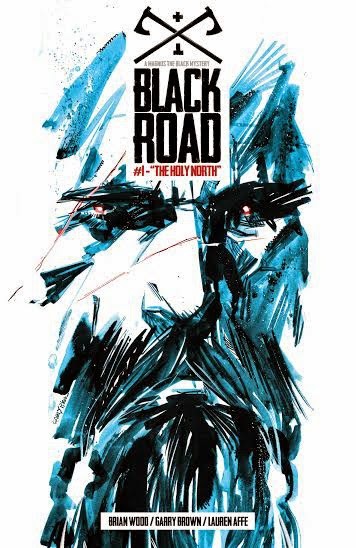 BLACK ROAD In 900 A.D. Norway, Magnus The Black is a fixer for the Church. A Viking, born pagan, he is mistrusted by both sides, yet good at his job. When a simple bodyguard gig goes wrong, his efforts to make it right will unveil a secret that threatens to anihiliate his native culture. From Northlanders writer Brian Wood and artist Garry Brown. PLUTONA A five issue mini-series by writer Jeff Lemire and artist Emi Lenox, taking the Stand By Me road as a group of kids find the body of a the world's greatest super-hero dead in the woods. WE STAND ON GUARD I have sorely missed artist Steve Skroce. In 2015 he returns with writer Brian K Vaughan no less, for this futuristic war between a small group of Canadian freedom fighters and the invading American forces with their robots. I HATE FAIRYLAND The creation of fan-fav artist and writer, Skottie Young, the series inspired by thoughts of killing the characters of Green Eggs and Ham in Looney Tune-ish ways as he read the Dr Seuss classic to his kids, tells of one lady stuck in Fairyland for 30 years, looking as though she is eight (click to enlarge). Close Contenders Paper Girls = (W) Brian K Vaughan + (A) Cliff Chiang, featuring four girls afflicted by something very strange. Stranded teen survival tale No Mercy = (W) Alex de Campi + (A) Carla Speed McNeil. (W) Marjorie Liu + (A) Sana Takeda = Monstress, starring a girl connected to the deadly monsters of 1920's earth. Wait...I have two new BKV series to read? Yay!!!! Oh, and Plutonia sounds like the perfect present for an old friend of mine after I finish reading it myself. Not to mention I hate fairy land. Excellent line up. I hope they live up to the blurbs. True Random, it looks like a pretty heavy set list up there. I hate Fairyland probably steals my dinero though, just looks the twisted kind of black humour I like to laugh away at. That and We Stand Guard. It's Image does Alpha Flight with robots. How can that be bad? I gotta' say all of these sound really, really good. Thank god for comics like these and the diversity they bring to the table. I hope they make it in this current marketplace. Hope so Dale. Mind you there's enough series ending at the big two... gotta fit a few other publishers in the holes don't we... however long they are open for.